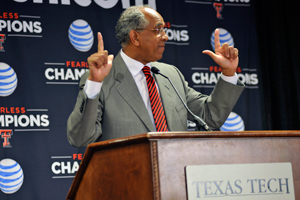 Tubby Smith agreed this week to become head coach of the Texas Tech men’s basketball team. He’ll start off earning $1.6 million in guaranteed compensation. That amount is scheduled to increase by $100,000 each year through the 2018-19 season. As compared to the $1.6 million he’ll make this season in Lubbock, Smith would have been guaranteed at least $2.25 million in compensation at Minnesota (a difference of $650k or 41% more than he’ll make at Texas Tech). Going forward the guaranteed compensation gap will close up slightly. Smith’s required annual raises under his Minnesota agreement would have been roughly half of the $100,000 he’s to receive as the leader of the Red Raiders. Tubby shouldn’t be short on cash after the significant buyout of his contract by the University of Minnesota, but going forward his decrease in pay is substantial. In addition to the lower guaranteed compensation, Smith’s incentive potential is far lower at Texas Tech than it was at the ‘U’. The Gophers also included some easily achievable bonuses for Tubby. Smith coaches team to a 4th place conference finish and NCAA tournament appearance, where his team loses in their first game. The team has an APR of 950 and graduation success rate of 50%. Using the same hypothetical scenario above for both schools, Smith would make over $900k (55%) more at Minnesota in 2013-14 than he would at Texas Tech. Coach Smith, whose teams at Minnesota had their own troubles with APR scores, could run into academic issues at Texas Tech related mostly to seasons prior to his arrival. Beginning with the 2015-16 contract year, Smith would not receive any incentive payouts if the team is subject to a postseason ban or has been penalized otherwise with respect to poor APR performance. The administration at the University of Minnesota believes the men’s basketball program can and should be better. They needed to consider whether Tubby Smith gave them a decent shot at being better. After six seasons as the Gophers’ head coach, Tubby Smith was losing his talented front line combo of Trevor Mbakwe and Rodney Williams. Smith’s teams had never been above .500 in the Big Ten and never secured a single-digit seed in the NCAA tournament. Year seven projected to be more challenging than 2012-13. Smith was a coach with a huge contract, few results and no answers. The Gophers’ basketball program was stuck with a low ceiling hanging over its head. Minnesota acted the right way by terminating Smith’s employment. No matter who the next head coach is, he will give the program a chance to be better. The downside risk is that the team on the floor does a bit worse under a new coach than it would have under Smith. Instead of back-to-back six win seasons, maybe it’s only five wins a year. Instead of an 11-seed in the NCAA tournament, perhaps the Gophers are slotted at No. 12. The upside potential is far greater than the downside risk. The success of the new coach is something to be judged over the next several years, not in the coming weeks. The firing of Smith is something that can be judged today and it was a wise decision. When asking about Tubby Smith as a basketball coach the most frequent response you’ll hear is that he is a nice man. The on court performances of his teams at Minnesota were disappointing and that can’t easily be defended. The result is that Tubby supporters must rely on hypothetical nonsense or go off topic and into emotion-invoking cliches. The fact that Smith had the men’s basketball program going nowhere fast is plenty of reason to let him go. However, a lot of people praise Smith as a great coach because of his personality or perception thereof. It’s a credit to the man that he has so many friends and fans. Do the cries of him being “too decent” and “doing things the right way” deserve consideration with respect to judging his shortcomings on the court? When people say Smith (and other coaches whose teams don’t do well) does things “the right way”, they are implying that this is unique in college basketball. Compliments are easy to hand out. However, those who praise a coach for doing things the right way as though it’s unusual will cower when asked to name some coaches that don’t do things the right way. I think “the right way” is usually just a way to deflect attention away from relevant topics. Again, it says something about Tubby Smith that people stand up for him. He must be a truly good friend to a lot of people. That’s wonderful from a personal relationship perspective, but did he do things the right way at Minnesota? It’s not necessary to get deep into issues that haven’t surfaced to the view of most people, but just glossing over a few well known items is enough to question “the right way” argument. In the civil courts: Smith’s missteps in attempting to hire Jimmy Williams as an assistant set the tone and have cost the school substantial amounts of time, money and goodwill. In the criminal courts: Multiple players brought in by Smith were guilty of multiple crimes while at the U. In addition to player issues, Smith’s own son and member of the coaching staff contributed to the crime count this fall (adding to the argument for an anti-nepotism stance going forward). Odd transfers: Players leaving a school is a normal occurrence in D1 basketball. However, the circumstances around several player departures from Minnesota have been quite unique (including Devoe Joseph [gave up a year of competition eligibility], Colton Iverson [transferred after junior season despite being required to sit out a year at Colorado State] and Royce White). In the classroom: A key player became academically ineligible in the middle of a season. In addition, Minnesota’s Academic Progress Rate (APR) has been the worst in the Big Ten over the past few years. The basketball team is not of out the woods with regard to the potential of falling into postseason ban territory due to the poor academic performance of Smith’s student-athletes. Tubby Smith and the program under his direction didn’t perform well on the court, off the court or in the courts. Imagine if he was like most coaches and had done things the wrong way. After a 15-1 start to the 2012-13 season, Minnesota men’s basketball head coach Tubby Smith had raised his career winning percentage above .700. That’s an impressive mark, but after four consecutive losses it may be difficult to get back into the 700 Club again. Even today a 20-win season is mentioned as a noteworthy accomplishment despite there being more games on D-I schedules in recent years. Considering a coach’s winning percentage may be a better measurement, but just like 20 wins, the achievement you chose to represent a “good” season is completely subjective. Many would probably agree that winning more than two-thirds of your games could be called a “good” season. To think about it in simple terms, if you played 31 games and won more than two-thirds of them, your record would need to be 21-10 or better. Winning more than two-thirds of your games isn’t easy, but it’s not unusual. Last season five Big Ten teams won more than two-thirds of their games. In years one and two as a new head coach at Tulsa, Coach Smith won 56.7% and 51.7% of his games, respectively. Two more years at Tulsa followed before a two year stay at Georgia. From there Smith went to Kentucky where he coached for a decade. After his first two seasons as a head coach at Tulsa, Smith’s teams would win more than two-thirds of their games each year for the next twelve seasons. His run through the 2004-05 season was impressive. Since then, however, Smith’s teams have never won more than two-thirds of their games. His final two years at Kentucky weren’t bad by most standards, but the performance was such that it was time for a change. Now it’s year six in Minnesota and the Gophers are still trying to win more than two-thirds of their games in a season for the first time under Smith. After four straight losses, could this still be the year? Tubby Smith enters his sixth year as Minnesota’s head coach looking for a third appearance and first victory in the NCAA tournament. In each of the past two seasons, the Gophers have gone 6-12 in the Big Ten, but believe they have the experience and personnel to earn an invite this season. Minnesota returns most of the team, including Trevor Mbakwe who is back after an ACL injury last November. The pieces to win are there, but it will be up to Coach Smith and his staff to optimally assemble them for the desired result. Trevor Mbakwe (14.0 ppg, 9.1 rpg in 7 games) is coming back after ACL surgery, but is now ready to get back on the court. His aggressiveness and athleticism are keys to his game, but a player like Mbakwe will likely toss off the rust quickly and be close to top form early on in the season. The 6’8”, 245 pound sixth year senior is an elite rebounder who blocks shots, draws fouls and finishes close to the basket. Without Mbakwe a year ago, the Gophers used a team effort to do quite well on the offensive boards, but he’ll be a big help in keeping the opposition from getting second chances. Rodney Williams (12.2 ppg, 5.6 rpg) is an electrifying performer who came on last year as a junior. Williams shot an impressive 59.0% effective field goal percentage (eFG%) and maintained a strong offensive rating while posting a career high usage of more than 19%. Defensively Williams uses his length and athleticism to block shots and create steals. His confidence appears to be at an all-time high and that does not bode well for Minnesota’s opponents. Junior wing Austin Hollins (9.2 ppg, 2.8 rpg) uses his long arms to get into passing lanes and defend. On offense, he’s not a high usage guy (just under 18% last season), but when involved he’s very efficient. Austin converted 53.4% of his 2-point attempts and 37.0% of his 3-pointers last year. A little more consistency would go a long way for Hollins and he is a guy that’s capable of reaching 40% from behind the arc. He’ll be asked to do more as a senior in 2013-14, but this season if he contributes great defense and a consistent 3-point shot, he’ll be giving Minnesota just what they need. Julian Welch (9.5 ppg, 2.4 rpg, 2.9 apg, 43.8% 3FG) is often overlooked, but the junior college transfer came in last year and performed very well despite some injuries. Now a senior, Welch might find it difficult to match his accurate shooting from last year, but if he can slightly improve his production from a year ago or even match it, he’ll be an important part of this team. Sophomore Andre Hollins (8.7 ppg, 2.1 rpg, 1.8 apg) projects to have a very good career. He struggled at times last year with turnovers and 2-point shooting, but proved he can make things happen with the ball in his hand. The Gophers are a team that will have different players leading the scoring from game to game, but Dre may be the most likely to post several 20-plus point games. Minnesota has two big redshirt sophomore centers in Elliot Eliason (6’11”, 260) and Maurice Walker (6’10”, 290) ready to get physical when needed. Eliason (2.6 ppg, 3.9 rpg) only averaged 15.1 mpg, but he blocked shots and rebounded at very good rates while on the floor. Of returning Big Ten players who were on the floor for at least a third of their team’s minutes, Elliot Eliason was quietly the best defensive rebounder of them all in 2011-12. He’s not very graceful and needs to cut down on turnovers and silly fouls, but he’s a large young man who makes a difference inside. Big Mo Walker hasn’t played since a December 2010 PCL injury and subsequent surgery, but is ready to go. With his size and history of injuries, you worry about his conditioning and ability to stay healthy, but if he’s able to consistently give minutes he adds not only a space eater on the blocks, but with his surprisingly soft hands his ability to pass and score are good. Sophomore guard Joe Coleman isn’t much of a shooter, but he is aggressive going to the rim and is excellent at drawing contact in the paint. Another option for Tubby Smith is Oto Osenieks, a 6’8” forward who was brought in as a shooter but was forced to play inside last year due to team injuries. The redshirt sophomore went just 11/41 (26.8%) from 3-point range last year, but with a little room he’s an excellent shooter. Freshmen Wally Ellenson (6’4”, 200) and Charles Buggs (6’8”, 200) both should get some chances to audition their skills during parts of the nonconference schedule. Ellenson has jump-out-of-the-gym athletic abilities, can get hot from long range and won’t be outworked, but did break his hand in late October and could be unavailable well into December. Buggs is a face up four man at this point and needs to gain strength, but he’s very long which will should help him defend. Both young men are athletic and able to score, but they’ll need to prove themselves defensively in order to earn any meaningful minutes. The Gophers should be able to reduce their turnovers in 2012-13. Last season’s turnover rate was nearly 23% and in conference they gave up the rock more often than any other team. Both Dre Hollins and Julian Welch were new to the program and had often played at shooting guard before arriving in the Twin Cities, but in addition to the point guards, the turnover bug bit most of the team. With a veteran squad, Minnesota must be better. Minnesota should be able to improve in three defensive areas (although perhaps not the most important area – field goal defense). Having a number of long, athletic defenders, being mediocre at turning the opponent over isn’t good enough. Look for the Gophers to create more defensively in 2012-13. With Trevor Mbakwe back, this team should not repeat last year’s defensive rebounding performance that put them all the way down in tenth place in the conference. Finally, the Gophers put the other team on the line far too often a year ago. Minnesota shot almost four fewer free throws per conference game than their opponent. Another year of experience for many of their players and Mbakwe drawing all sorts of attention inside should result in net improvement here. Having healthy bodies available is not the same thing as having great depth. We believe there are two optimal lineups (depending on the opponent) for Minnesota this year and also believe that Minnesota’s best players can add significantly more value than the rest of the roster. However, Tubby Smith has used a relatively large bench in the past and frequently has subbed in three to five players at the same time within the first 10 minutes of games. The difference between winning and losing a game in the Big Ten and against competitive nonconference opponents is not large and lineup choices can greatly influence outcomes. There are a lot of kids who can play and help the Gophers this year, but there is a core of seven or eight players that should get the great majority of minutes. Based on history, Tubby’s game plan may not agree. Things get physical in the Big Ten, but as long as the Gophers have a healthy Trevor Mbakwe, Mo Walker and Elliot Eliason, they are in great shape. That said, Mbakwe and Walker will be back on the court this fall for the first time since having major knee surgery. In addition, Walker has dealt with other injuries and his conditioning remains a concern due to his size. If any one of these three is unable to play, it takes away a lot from this team. Andre Ingram is a tough inside guy, but doesn’t have the size or skill of the others. Other options to help defend against post players include Oto Osenieks and freshman Charles Buggs, but they both lack the strength and size to defend some of the bigs that Minnesota will face. Both Trevor Mbakwe and Rodney Williams have aspirations to play in the NBA. The seniors also have things they’d like to prove in order to better their chances of getting a shot at that level. It will be interesting to see how the coaching staff balances out what might be better for the pro prospects of its star seniors and what might benefit this year’s Gopher basketball team. Most important for Mbakwe is to simply show that he’s still a monster inside that can score, rebound and defend. He may want to show off a mid-range jump shot, but that may not be a bad thing to occasionally display. If he’s playing with aggressiveness and explosiveness, it’s going to help both the team and his draft stock. Rodney Williams is more the concern here. Last year Rodney excelled when working with a lot of space inside. Williams took more than half of his shots at the rim and was incredibly efficient in doing so. The majority of these shots were created with the help of assists and many were made possible because he was playing with three guards and a center. If Minnesota has Walker or Eliason out on the court with Mbakwe and Williams, it’ll require more creativity on the coaching staff’s part to get Williams the ball where and when he needs it. Meanwhile, Rodney has just one more year to prove that he can improve his ball handling and perimeter shooting. While we believe he can show improvement, having Williams trying to create his own shot or knock down 3-pointers is not the most efficient route for him or Minnesota’s offense. Above all, Rodney needs to show what a great defender he can be as that’s what most likely to get him a chance at the next level. In addition, the confidence, aggressiveness and leadership he showed late last season must carry over and be consistent throughout the year. These things will not only benefit Minnesota this season, but also Rodney’s future. In recent years Minnesota has been one of the better shot blocking teams in America and they should be good again this year. However, they will miss Ralph Sampson. With Mbakwe and Sampson unable to play much of last year, the team’s block % fell and one result was a rise in their opponents’ 2-point field goal percentage. We don’t see a big issue here in 2012-13, but a nice improvement doesn’t look likely either. Last season other teams liked the idea of attacking the paint more than in the past because of the personnel out on the floor. As a result, there was a drop in the frequency of 3-point attempts taken by opponents. In addition, the Gophers benefited from a relatively weak long distance shooting performance by Big Ten foes. For several reasons, we believe the lower 3FG% by conference opponents last year was partly due to chance and in 2012-13 we project it to rise. Combined with the possibility of more attempts coming from behind the arc, the Gophers have a big challenge if they are to reduce their overall field goal percentage defense in the Big Ten. 2013 Recruiting: The Gophers have added two Chicagoland kids that have played together on both high school and AAU teams. Alex Foster, a 6’8” forward, and 6’4” wing Alvin Ellis are quality recruits and good fits for the Minnesota program. MINNEAPOLIS — According to Minnesota Gophers men’s basketball coach Tubby Smith, Trevor Mbakwe is “lucky to still be around here.” Smith’s comments were in response to questions about a DUI arrest this summer. The DUI arrest triggered probation violations in two other criminal cases, one of which could cause Mbakwe to miss time. Mbakwe was found guilty of second degree felony battery in Miami this past February and now faces the possibility of additional penalties in that case. LateNightHoops.com spoke on Friday with Miami-Dade State Attorney’s Office spokeswoman Terry Chavez who said that Mbakwe “is scheduled to personally appear in our Court to answer to the violation” next Wednesday, October 17. Ms. Chavez also said that her office did not have an offer to resolve the matter, so it is doubtful that Mbakwe will take a plea on Wednesday. Therefore, the State Attorney’s Office anticipates that on Wednesday the case will probably have a future date set for a probation violation hearing. The DUI arrest was made on July 1, 2012 and Mbakwe, 23, pled guilty on September 10, but the university had not disclosed the matter publicly until questions arose after LateNightHoops.com broke the story early Friday afternoon. Since Mbakwe suffered a season-ending knee injury last winter, he has been found guilty in three separate criminal cases. Coach Smith did say Mbakwe was initially suspended from all team activities when the DUI incident occurred, but he is now being allowed to participate. The senior forward took part in the team’s scrimmage Friday night and was moving around well in his first action since undergoing ACL surgery late last December.